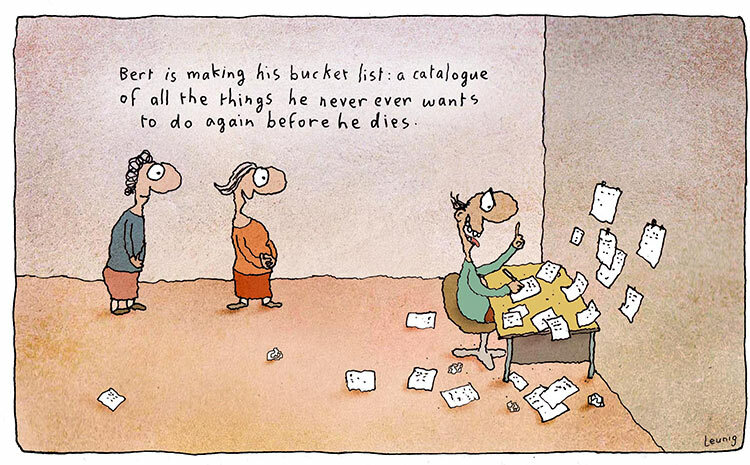 Michael Leunig, one of Australia’s best known cartoonists, has an interesting take on the whole bucket list concept. • Necropsy an elephant that had been dead for two days in 33oC heat, while surrounded by a million flies. • Perform a foetotomy in similar environmental conditions. A foetotomy involves cutting up a dead, usually decomposed, calf while it is still inside the mother. Very tricky and the stink doesn’t leave you for days and days and days. Not so good if you have a dinner party invitation. • Euthanase anybody’s much loved pet. • Go back to primary school and experience all the bullying from kids and beatings from teachers that involved. • Fly. This one is particularly difficult considering many of the things I love to do involve overseas travel. • Go to a funeral, particularly my own. • Be a teenager again. • Eat asparagus and Vegemite. • Worry about tipping: how much, should I, shouldn’t I? • Watch a reality TV show. • Go to the opera. • Be asked what I am thinking (because it is too embarrassing to admit that I am not really thinking anything at all). I have just returned from two fantastic weeks in the Land of the Rising Sun. This being my first trip I was struck by the country’s unique ability to embrace both the old and the new. The people were all incredibly friendly, polite, law abiding and helpful. Compared with Australia, Japanese society seemed very structured with a long list of social conventions that regulate people’s daily lives. While this may appear restrictive once I had deciphered the system I found knowing what was expected in various situations to be oddly relaxing. It was probably just my German background enjoying the predictability of it all. The old joke about why the German crossed the road (The little man is green now. It’s allowed) is equally applicable to the Japanese. People formed orderly queues on railway platforms to board the trains, the doors of which always lined up with the carriage numbers marked on the ground. The trains were insanely punctual and reliable. People did not eat in public. Shoes were removed before entering temples, restaurants, homes, castles and sumo rings, which is a very common sense way of not tracking dirt everywhere. If you do decide to visit Japan do not, under any circumstances, wear a pair of lace up hiking boots. Given that the majority of Japanese claim no personal religion they have presumably decided on their social conventions all by themselves, producing a set of guidelines that work for them. Considering their extremely low crime rate, compared with many devoutly religious countries, it certainly seems to be working for them. Japan does, however, have two major religions and, interestingly, most people profess to follow both. Shintoism is Japan’s own home grown religion. It has no major prophet and no all-consuming deity. In fact there are eight million deities or spirits as all animate and inanimate objects contain a kami or spiritual essence. It is not necessary to swear allegiance and forsake all others to be Shinto. Anyone who practices Shinto rituals is counted as belonging to the religion. The Japanese have also imported Buddhism and see no contradiction in following both this religion and Shintoism, picking the best bits from each. It is refreshing to see religion working for the people instead of the other way round. Most people celebrate birth events according to the Shinto way but use Buddhist rituals for funeral arrangements. According to what one Japanese person told me the Shinto afterlife is not as appealing as the Buddhist nirvana. There are no Shinto cemeteries. Cremation is a Buddhist ritual. I was told that Shintoists believe the spirit returns to the earth and bodies were either thrown in the river or left on a hillside, presumably for scavengers to dispose of. I can feel myself becoming more Shinto all the time. As a member of one of the world’s fattest countries it struck me how few overweight Japanese there are. This should come as no surprise as the Japanese consume virtually no bread products and no chocolate. In fact almost none of the places we ate at featured a dessert menu. Dairy products were also all but absent from the diet, which is probably sensible too as we appear to be the only species that drinks the milk of another well into adulthood (apart from my wife’s border collie who used to zip into the milking shed of any farm she visited, in order to clean up the spilled milk). Foods are minimally processed with a strong emphasis on raw foods including fish. I did enjoy my sashimi but I will be worming myself as soon as I get the chance. We cooked many of our restaurant meals ourselves much to my son’s indignation who felt that, as we were having a night out, the least the restaurant staff could do was to cook it for us. We made our own sukiyaki, which featured melt in the mouth Hida beef, that I’m sure was not particularly healthy given the reason for the meat’s flavour and tenderness was its intense marbling. We also concocted our own chankonabe, a stew containing seafood, chicken, vegetables, rice and egg designed to bulk up the sumos, and our own okonomiyaki, a type of savoury pancake filled with whatever takes your fancy. It was also good to see the Japanese making the most of local produce consuming a wide variety of unrecognisable mountain vegetables, as they called them. I found the fern to be quite tasty but I don’t think I will miss the lotus root. Our diet does not seem to be nearly as varied as theirs. All of this no doubt contributes to the fact that the Japanese now have the highest life expectancy in the world. And the best part? Tips are neither given nor expected. Politeness and good service are an expected part of the culture. What Is The Difference Between An Australian And A Canoe? A canoe tips. Despite having made many visits to the US over the years I still find the rather quaint custom of tipping somewhat confusing. As I understand it, a tip is meant to be reserved for excellent service. In reality it appears to be universally expected, regardless of the quality of the service, and I have had some pretty negative reactions when I haven’t left one (like a waitress in New York chasing me down the street after I left her café). Not that it says in writing anywhere that a tip is compulsory or even how much I am supposed to give. Am I about to leave way too much or insultingly little, is one of my frequent worries. And why leave the tip at all? The taxi driver that picked me up from the airport, drove me to my hotel and dropped me off. I paid him whatever it said on his meter for this service. Now I am supposed to hand over another 18%, and for what? His excellent service? He barely engaged me in conversation during the trip and was unable to provide a weather forecast for the next day. Did he give me a cup of freshly brewed coffee or the daily newspaper to read during my journey? No. He did what was expected of any taxi driver anywhere in the world, yet he acted as if he had done me a terrific favour and I would be incredibly miserly if I did not part with an extra gratuitous sum of cash. It’s not like the fare was cheap to begin with. And who exactly am I meant to tip? For some reason I am expected to tip the waitress who is only doing her job by bringing me the meal (if anything I’d rather tip the chef for preparing the magnificent repast and not spitting in it), but I’m not expected to tip the girl at McDonalds for handing over the food. Why? What’s the difference? Apparently the tip is designed to make up for the shortfall in income that occurs because the employer is too cheap to pay a decent wage. Why do we allow employers to get away with paying rubbish salaries to waitresses but we don’t care enough about the wages paid to McDonalds’ employees to bolster them up a bit? If I am expected to fork out all this extra cash for no good reason, then fine, but how about making it official by adding it to the account, as is done in civilised places like Venice? That way there are no surprises and I know what I’m up for up front. Alas, there is no longer any pride taken in a job well done. There is only smarmy toadying in the hope that a large sum of money will appear to reward appropriately servile behaviour. Having said all that, I cannot fault the excellent service and food at the 8th Street Steakhouse in Steamboat Springs, Colorado. I am sure my generous tip had nothing to do with it.